In any consideration of recent technology, it helps to remember that we had working nuclear bombs before we had working nuclear reactors. As new layers of wonder blossom around us, we need to be aware that there may be less wondrous layers beneath our cultural radar. Wearable computers offer us the opportunity to keep tabs on our health and our loved ones. They create equally enticing access for criminals. Marc Goodman understands the applications and misapplication of new technologies. But he also knows that the way to reach readers is with stories, not facts. You'll find plenty of facts in 'Future Crimes: Everything Is Connected, Everyone Is Vulnerable and What We Can Do,' but you'll generally find them in engagingly-told true stories of current computer crime. Goodman's book is something of a page-turner as he explores and explodes our notions of a brave, safe new world. For every plus, there is a minus, most of which we are dangerously, not blissfully, unaware. Much of what you'll read here is not simply informed speculation, but recent history. It helps to remember not just Moore's Law, that chip speed doubles about every 18-24 months, but William Gibson's law as well; "The future has arrived, it's just not evenly distributed." Goodman is about two days to twenty years ahead of the cutting edge. Consider this book a sneak preview of what you hope never to see or experience. 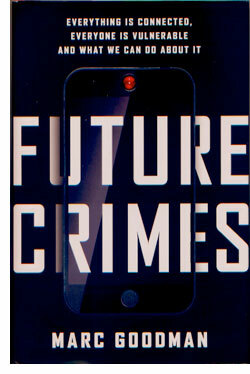 'Future Crimes' is crisply organized and cleanly written. Goodman knows how to raise an alarm without hyperbole. Unfortunately, the facts of the present give us plenty to worry about in the future. Here's a book that will certainly change your perceptions of everyday activities like looking in or posting to Facebook or Twitter. It turns out that nothing in life is free. Some stories in here are going to be familiar to some readers, but Goodman is an excellent writer. Even if you know what happened, his retellings are gripping reading. With the present-day stories as a backdrop in the reader' minds, the speculation becomes grounded in a reality so as to make it even more alarming. As Goodman ramps up the terror, he makes his point about understanding risks before they reach apocalyptic potential. Ignorance of the crime will not prevent you from becoming a victim. In fact, it makes it more likely. For all the bad news he brings to the table, Goodman's overall story arc is encouraging and empowering. It's certain that inexpensive genetic manipulation will bring with it new hazards, but if we at least understand the potential we can make some intelligent decisions to prevent the criminalization of every new technology. Now, Goodman concludes, is the time for us to think about security. His book finishes with steps we can take now, before the problems become dangerously problematic. We'd do well to learn from our own example. Technology has its pluses and minuses, and many of the former ultimately prove to be the latter. From Hiroshima to Three Mile Island, we'd better learn to connect the dots while we still can.